Together here in our complete combo tour experience you may visit Portland Women's Forum, Vista House, Latourell Falls, and Multnomah Falls. Then, we continue driving east father up the river to the town of Hood River. With the mountains views of Mt. Hood, Mt. Adams, farms and wind Surfing makes for an unparalleled Oregon experience. After lunch, we will visit 2 vineyards in the region for some amazing wine tasting and learn about the region history and culture as it has developed in the wine industry in the area. This scenic tour begins with a pickup from hotels located in the Downtown Portland area or from prearranged locations. 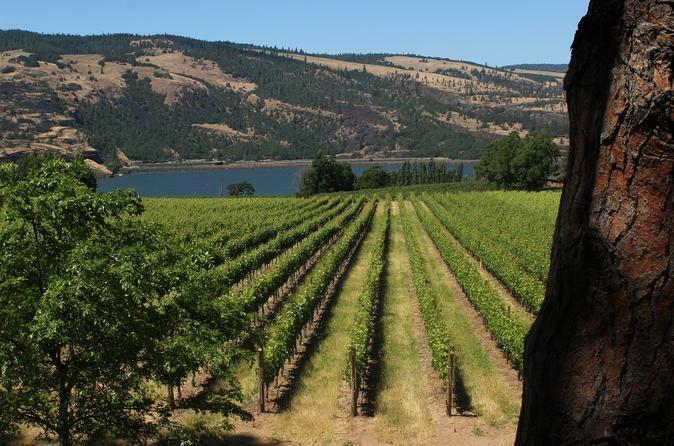 Visit the beautiful Columbia River Gorge! We will first stop at Portland Women's Forum. The view from here is absolutely breathtaking and with the scenic Vista House and the wide expanse of the Columbia Gorge in the background, more photographs of the Columbia Gorge are probably taken from this point than anywhere else. Next, we stop at Crown Visit Point House with a complete overlook of the Gorge region. You will have the opportunity to tour through the historical site. Crown Point Vista House, best known of the scenic lookouts along the Historic Columbia River Highway, provides a panoramic view of the Columbia River. Our next stop is Latourell Falls. This waterfall is usually most recognized for the large patch of bright yellow lichen adorning the cliff face to the right of the falls, and this characteristic has led many famous photographers to this captivating location. Our second waterfall is Bridal Veil Falls. Well known for thousand of webbing portrait around the world.You will have the opportunity to get up close to these amazing this waterfalls. Multnomah Falls will take your breath away. This stunning waterfall is not only the tallest waterfalls in Oregon with a 620 foot drop it is also one of the most beautiful. We will continue East to the town of Hood River, where natural beauty creates for a windsurfers paradise. Your guide will inform you how the incredible landscape was shaped many years ago. Lunch in Hood River at your choice of several establishments coupled with views of Mt. Hood and Mt. Adams. Stroll down the street to the boutique shops and or visit one of the wine tasting rooms optional during your free time. Next, we will visit two vineyards in the region where each vineyard offers their unique wines, charming surrounds, and once more accompanied by the surrounded Mountain views. Finally we will travel back to Portland for hotel drop off.